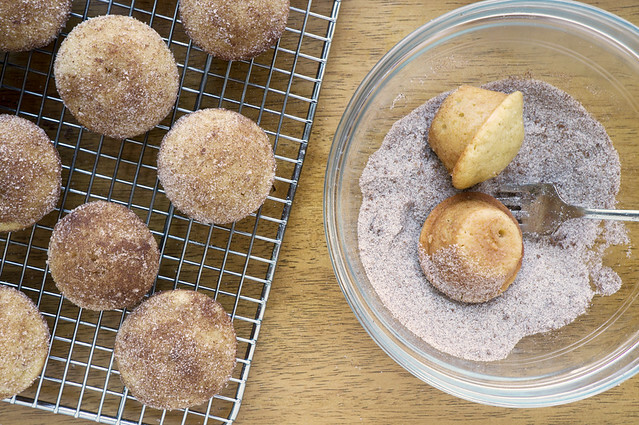 Cider Doughnut Muffins have all of the cozy flavors of a good doughnut—thanks to reduced apple cider, cinnamon, and nutmeg—with a lot less work. If I had to pick just one Fall treat to enjoy from the first day of the season to the last, Apple Cider Doughnuts would win, hands down. ‘Tis the season where pumpkin spice everything is on the menu, I know, but there’s nothing in the world like warm cider doughnuts. Lightly-spiced and enrobed in a light, crunchy coating of cinnamon-sugar, willpower doesn’t stand a chance in their presence. In a perfect world, my kitchen would be equipped with some sort of “Doughnuts on Demand” button so things like pajamas and uncoiffed hair wouldn’t stand between me and doughnut glory. Alas, such conveniences don’t exist. What’s a girl to do for a last-minute craving on a Sunday morning? 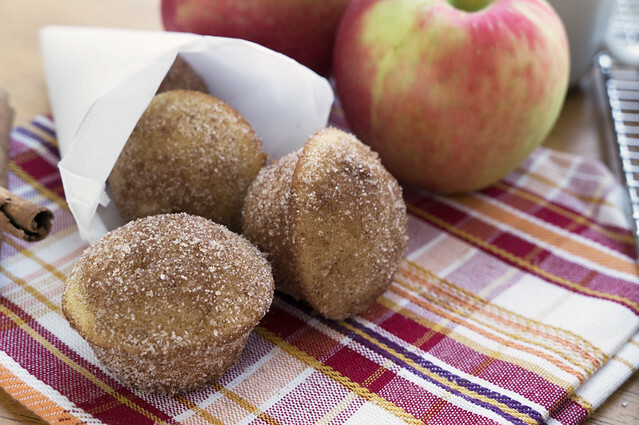 Make Cider Doughnut Muffins! I grew up just five minutes from a wonderful little cider mill that not only pressed its own cider, but churned out a steady supply of delicious fresh doughnuts daily. That is, until the mill closed (like my favorite deli; another college-break craving Fail). New Jersey has no shortage of orchards and farm stores that sell cider doughnuts, so I wasn’t at a total loss, but they were no longer seconds from my doorstep. I’ve made them at home a number of times, which is fun, but between the rolling, cutting, and deep-frying, they can be a bit of a process. As much as I love to cook, sometimes, I’m just in the mood for something a little simpler. After stumbling across a recipe for Cider Doughnut Muffins on the Yankee Magazine website this past weekend, I have to say that I’m disappointed I didn’t discover the concept sooner! The muffins had all of the cozy flavors of a good doughnut—thanks to reduced apple cider, cinnamon, and nutmeg—with a lot less work. The original recipe calls for standard-sized muffin tins, but I prefer them as mini-muffins. 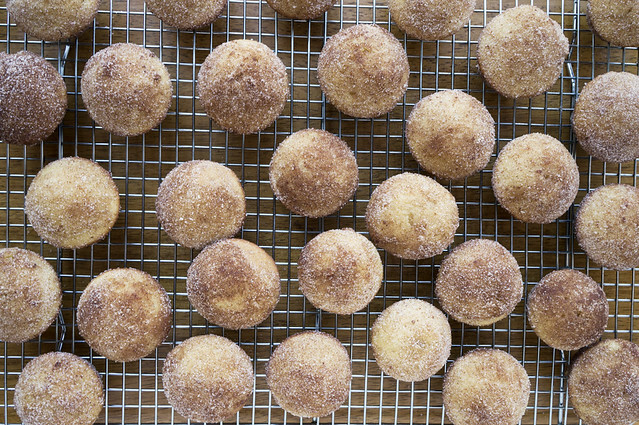 They come out kind of like doughnut holes, and the cake to cinnamon-sugar topping ratio is much more reminiscent of an actual cider doughnut. 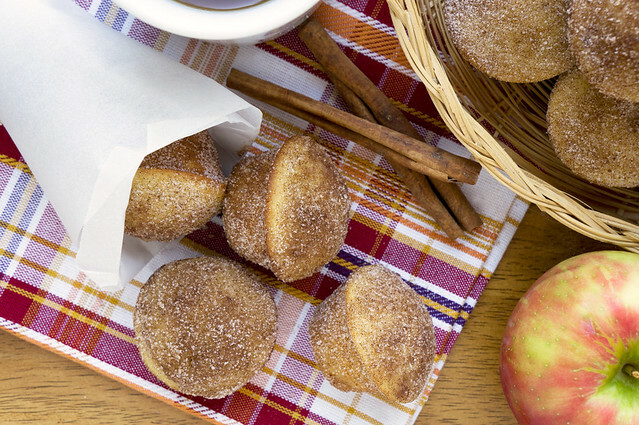 Will these muffins totally replace traditional cider doughnuts in my heart? Probably not, but they were a delicious treat that I’ll definitely make again when I can’t get to the orchard or don’t want to deal with the work of frying at home. They’re great for a weekend breakfast, as a part of a Fall brunch buffet, or an after school snack for the kids. With a batch of these in the oven, maybe “Doughnuts on Demand” isn’t such a crazy thought afterall! Did you know? Striped Spatula is on Social Media! You can find me on Facebook, Instagram, Pinterest, and Twitter. 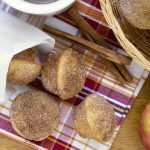 Cider Doughnut Muffins have all of the cozy flavors of a good doughnut---thanks to reduced apple cider, cinnamon, and nutmeg---with a lot less work. Preheat oven to 375 degrees F, with rack in the center. 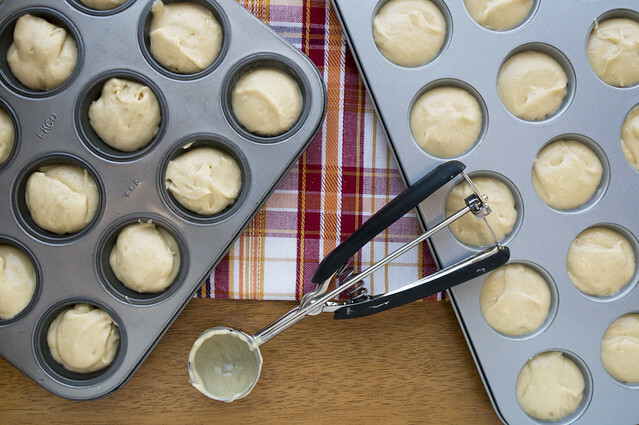 Grease or lightly spray mini muffin tins (enough for 36 muffins). 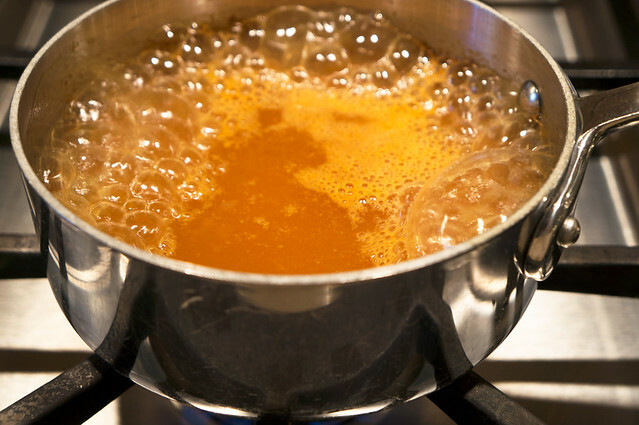 In a small saucepan, bring apple cider to a boil over medium-high heat. Simmer until cider is reduced to 1 cup, about 20 minutes, lowering heat as needed to maintain a steady bubble. Remove from heat and cool. 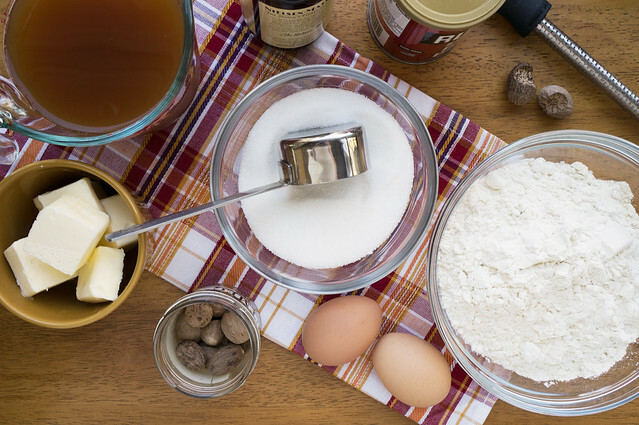 In a medium bowl, combine flour, nutmeg, cinnamon, baking powder, baking soda, and salt. Set aside. In a large bowl, using a hand mixer, (or in the bowl of a stand mixer fitted with the paddle attachment), cream the butter and sugar until light and fluffy, about 3-4 minutes. Add eggs, one at a time, mixing on low speed until incorporated. Mix in vanilla. Add the dry ingredients to the batter in three additions, alternating with the cooled, reduced cider (start and end with flour). Gently beat just to combine after each addition, scraping the bowl as needed. Divide batter evenly between 36 mini muffin cups. Bake 10-12 minutes, until a cake tester comes out clean. Transfer pans to wire racks and cool for about 5 minutes. *I enjoyed these muffins most the day they were baked, but they were still very good on the second day. I found that the tops became a little soggy upon storage from having been brushed in butter, but this was easily remedied by popping them into the oven (350 degrees) for a few minutes, just to lightly warm. I too saw this recipe on Yankee website and had to try – esp as I now live in the UK and don’t have easy access to apple cider donuts (sniff, sniff). I tried as mini-muffins as well and could not get them out of the pan. Any particular tricks? May just be that I need a new mini-muffin pan. I tried Pam spray, shortening, dusting w/ flour, etc. Shortening then dusting w/ flour was best result, but a pain. Any tips would be greatly appreciated! Hi Katie, thanks for commenting! I’m so sorry you had problems with sticking. I’ve definitely been there myself in the past and it’s frustrating! Is the sticking primarily on the bottom? If so, you might try placing the hot pan on top of a wet towel for a few minutes. This will often help stubborn cakes and muffins release. Over the past year or so, I’ve been using “Bak-Klene Bakery Spray” and am thrilled with it. In my experience, it works just as well as greasing and flouring (in a fraction of the time). It doesn’t clump or leave a film on the pan, as some of the other sprays do. Unfortunately, I’m not sure if this is available in the UK (I buy it at Williams-Sonoma), but you might be able to find a similar professional-grade product if you do a lot of baking. i’d love to try cider doughnuts. these look delish!